Arteric Explains How to Uncover Hidden Marketing Insights. Summit, NJ, December 06, 2017 --(PR.com)-- Arteric is a healthcare digital marketing agency that’s been demystifying leading-edge technology and making it practical for healthcare marketers for two decades. On December 6, Arteric’s Hans Kaspersetz continued this effort when he explained how to apply artificial intelligence (AI) to uncover hidden market insights at Medical Marketing and Media’s NextGen Data and Analytics workshop. 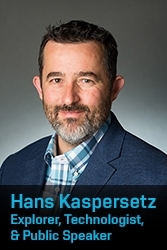 During a Rapid Fire session titled “Artificial Intelligence — Super Hearing for Healthcare Marketers,” Mr. Kaspersetz, Arteric’s chief operating officer and chief strategist, shared two quick case studies that illustrate actionable insights that emerge from deep analysis of readily available digital marketing data utilizing commercially available AI latent semantic analysis APIs. Those who can’t attend the MM&M program but wants to learn about AI for healthcare marketers can read about Arteric’s work with AI and listen to Mr. Kaspersetz on Life Science Marketing Radio. For two decades, Arteric has empowered healthcare brands and marketing communication teams to anticipate and execute on dramatic shifts in digital technology, transforming them into competitive advantage. Contact Hans Kaspersetz at 201.546.9910 to discuss how to apply AI to maximize the impact of your brand. Arteric is a healthcare digital marketing agency built on a foundation of technology expertise — digital strategy, software engineering, search engine optimization, and search engine marketing. Arteric develops the strategy and software — websites, mobile apps, and Web applications — that drive pharmaceutical and biotechnology digital marketing campaigns and connect the patients, caregivers, and healthcare professionals with information about life-changing therapies, technologies, and devices.